Some days are so hot and humid that iced tea isn’t quite enough. So freeze it into ice pops. Favorite herbal teas make tasty pops. Just brew them to twice the concentration—two tea bags or two teaspoons of loose tea per cup. Add your sweeter and freeze. You can also add a half teaspoon of spirit (gin, tequila, vodka), liqueur, or a splash of wine. 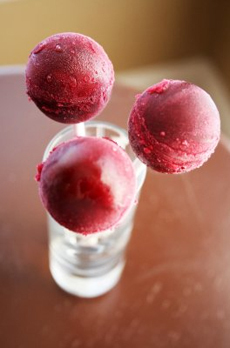 In the photo, chef Michael O’Boyle of Chicken Fried Steak.com has made ice pops with hibiscus tea, using round ice cube molds instead of conventional ice pop molds. Make some and cool off! Find more of our favorite recipes for sorbet and other frozen desserts. Photo courtesy chef Michael O’Boyle, ChickenFriedSteak.com.